A National Review article, posted December 4, 2017, written by former federal prosecutor Andrew McCarthy, entitled “It Is Now an Obstruction Investigation: Which means that it’s an impeachment investigation,” affirmed what’s long been obvious to many. The purpose of the Mueller Investigation is not now, nor has it ever been, to prove collusion between Russia and the Trump Presidential Campaign. That stated objective was, and remains, a red herring. What the McCarthy article fails to address is the real motive behind the Mueller investigation. Mueller’s investigation, based on the choreographed dissemination of a fake dossier, was designed to: (1) discredit the election of Trump and hinder his efforts to govern, and (2) misdirect the media’s attention – easily done – in order to distract attention away from an investigation related to Uranium One, as well as several other questionable behaviors that suggest possible criminal acts conducted by the Clintons. In short, the Mueller Investigation is a set piece, misdirection-by-distraction operation. And daily, more Americans are beginning to see that it is – fake. 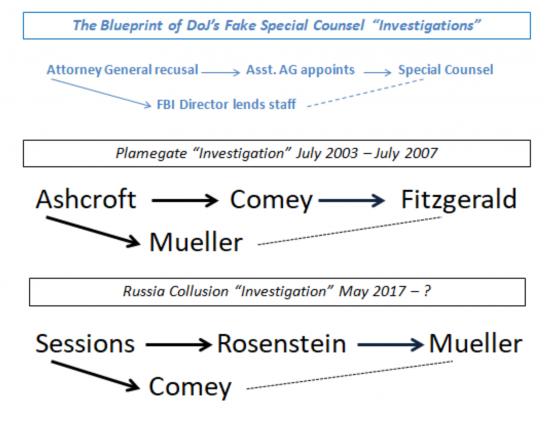 The pattern for the current operation was used in a previous “special counsel” puppet show: Plamegate. Two of the same players, Comey and Mueller, who starred in that marathon special counsel investigation that led to the process-crime indictment of “Scooter” Libby, kicked-off this latest show. The closer President Trump moves toward accomplishing major tax reform, the bigger the media headlines will chant the mantra of his inevitable impeachment. Daily, they become more desperate to damage Trump, as The Swamp runs scared. And, all those involved in the current and past DoJ Blueprint are Swamp creatures.